A leading campaigner has called for a strategy to tackle “insidious” online posts that allow individuals to make “discriminatory and hostile statements” about disabled people without being punished by the criminal justice system. Stephen Brookes a coordinator of the Disability Hate Crime Network, spoke out after police decided to take no action against the owner of a car boot sale business who posted an offensive, disablist post about his disabled customers on his Facebook page. In the post, which has since been taken down, Geoff Camden-Wiles, of Car Boots Cornwall, made a series of offensive comments, suggesting that his disabled customers were benefit cheats (“Cornwall’s malingers”), “bloody idle” and responsible for causing their own impairments through self-neglect. His comments caused outrage locally and among hate crime campaigners, and were branded “offensive” and “ignorant” after being shared on social media. The post led to a string of calls and emails to police, who have recorded it as a disability hate incident. In his blog (pictured), Camden-Wiles wrote about visitors to his sites who were “either disabled or acting disabled”, and suggested that “the reason the majority of you are disabled or acting disabled is because you have at some stage neglected yourselves in some way and/or you are bone bloody idle and don’t get enough sexercise nor exercise”. He then went on to claim that he did not recognise disabled people’s blue parking badges, because his sales were held on private land. Camden-Wiles said that his staff would try to allow people with a “genuine disability” who are “wheelchair bound or similar” to park near the event “but don’t arrive late when the sale starts expecting front row parking cos that ain’t going to happen”. He then suggested that wheelchair-users could get “a cheap thrill” from wheeling over the bumpy ground, before making a “joke” about holding a “Zimmer frame dance and race” with a “fake BLUE DISABLED pass” as the prize, which they could use “like hundreds of other people do”. Camden-Wiles’s company runs car boot sales in six locations across Cornwall, including Truro, Falmouth and Newquay. He later tried to justify his comments on his website, emailing the same statement to at least one of the disabled people who had complained, saying that his company had “contributed thousands of pounds for many local and registered charities however I have nothing personally against disabled persons nor their disabilities”. A spokesman for Devon and Cornwall police said: “Devon and Cornwall Police is aware of the post made on a car boot website in which comments were made about people with disabilities, having received a number of calls and emails via its 101 service. “The post was removed and an apology has been issued on the website. But Brookes said the case was “typical of one which continues to both tax and annoy” the coordinators of the Disability Hate Crime Network. He called for “strong penalties” and for individuals found responsible by police to have their websites taken down or be forced to post a permanent “full and detailed regret” for their actions, although he accepted that this would involve “a very tricky balancing act” between freedom of speech and censorship. Cornwall County Council said it could not take any action over the Camden-Wiles post because the sales are held on private land and so do not need a street trading licence. One disabled woman from Cornwall said she was “truly disgusted” by the police decision to take no action against Camden-Wiles, and said she would be talking to the police, other disabled people in the area and her local MP to call for further action. 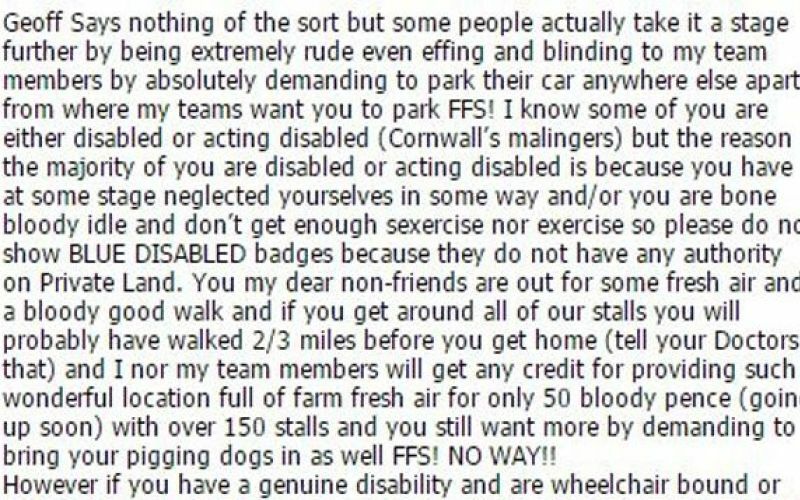 The disabled people’s organisation Disability Cornwall declined to comment on the incident to Disability News Service, but told a local newspaper that they were “concerned to read the offensive and disparaging post”. Camden-Wiles has so far not responded to requests to comment on his post.